Lots of celebrities rock the dark and mysterious smoky eye look but we all know they have stylists and makeup artists whose only task is to make sure their client’s look is perfect. The good news is that you don’t need a high priced makeup artist to get smoky eyes. This is a look you can pull off all on your own in the comfort of your own home. In this step by step tutorial to get smoky eyes I’ll guide you through the whole process and offer a few helpful tips along the way to help you make sure your look is perfect. Before we start though, let’s talk products. There are just a few things to mention about what you’ll need before we talk a little bit about useful tips for doing smoky eyes. First, eyelid primer isn’t required to do smoky eyes but it is most definitely recommended. You can use specialized eye shadow base, concealer or foundation as long as you’re sure your concealer or foundation is oil free. Primer gets your lids ready for color and keeps that color in place. Over the course of the evening, eyes shadow can sometimes migrate back into the crease of your eye. Applying primer helps prevent that. Shimmer is also not required but it can add a bit of spice to the look and make your eyes pop even more. Finally, you can play around with the color a little bit. In place of brown of gray shadow you can use dark blues, greens or purples. Try a few different ideas and see what you like the most. You may also want to try a bit of color on your lashes. Instead of just using black mascara, put colored mascara on the tips of your lashes. Just make sure you choose a color that compliments your shadow. Okay – that’s out of the way. Let’s talk tips! Leave your lips alone. Well, okay – you don’t want to leave your lips alone completely but you also don’t want to play them up. You’ll look overdone and you certainly don’t want that. When you’re doing something as bold as smoky eyes, you really want to let your eyes drive and let your lips ride in the backseat. Use neutral shade on your lips with a touch of gloss to do your lips. Anything more will be overkill – unless of course you’re hitting the red carpet for some major Hollywood event or posing for the cover of Glamour magazine. Let your shadow do double duty. You’re ready to start working on your smoky eyes but you realize you’ve run out of black eyeliner. If you have a shadow that works well wet you don’t have a problem. There are a lot of shadows out there that can double as eyeliner in a pinch. This is not just a great option for when you run out of eyeliner though. This can be a great way to slash your makeup budget as well. Use your concealer and powder last. While I’d normally recommend concealer and powder before you do your eyes, you’re going to make an exception anytime you’re going to be using a fair amount of darker shadow on your upper lid. Some of the shadow from your lid is almost certainly going to wind up under your eye. That is going to make your eye look far too dark. For smoky eyes, you are going to be putting shadow under your eye but you need to apply it carefully, not just have it fall where it wants off your brush. We’ve talked about the products and we’ve talked about some excellent smoky eye tips. Now it’s time to go through a step by step guide for doing smoky eyes. Before we start though, make sure you have everything you’ll need together and within arm’s reach. In total, the entire application process should take about ten minutes – less than that when you’re used to what you’re doing. Step One: Apply your primer. Prime the lid and wait for the primer you’ve used to dry before you move on to step two. It should only take a moment or two. Step Two: Apply your neutral shadow to your entire eyelid as a base. By your entire eyelid I mean from your lashes to your brow bone. You want to make sure you choose a color that will blend well. If you’re going to experiment with color save that for your general shade (we’ll talk about that in a moment). Stick to neutral shades for your base. Step Three: Use your black eyeliner pencil to line your eyes. You want to line your upper lash line and your lower lash line and you want those lines to extend from corner to corner. You want to make sure you get the liner into the lashes. Use your finger to hold your lid if you need to. The liner needs to be in those lashes! Step Four: Take a small, clean shadow wand or a clean Q-tip and trace over the liner. This will smudge the liner ever so slightly and soften it up a bit. You don’t want a crisp, clean line for smoky eyes. You can also use your finger but I would only recommend that if you don’t have a wand or Q-tip. Step Five: Apply your black shadow over the eyeliner on the top lash line only. Step Six: Using a small, clean shadow wand or a Q-tip, trace over the shadow to smudge it. Step Seven: Take your gray or brown shadow and apply it to your eyelid. Sweep the shadow on starting at your lash line up over the eyelid, the crease and finally ending just below your brow bone. When you close your eye, the shadow, if applied properly, will be in an oval shape. This will be used as your main shadow. You can experiment with the color of this one but to get the basic idea of what you’re doing, I’d recommend sticking with brown or gray to start. Step Eight: Take a powder brush or a cotton ball and lightly sweep it under your eyes. 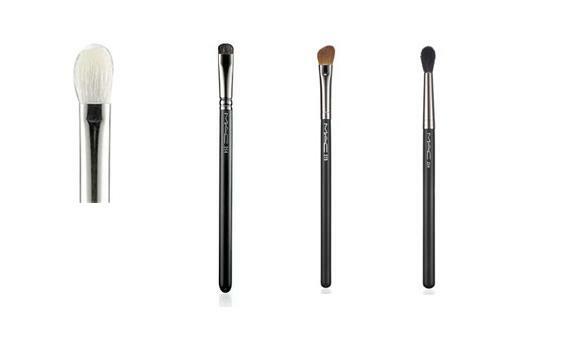 Cotton balls and powder brushes will lift the shadow without leaving a whole lot of the pigment of the shadow behind. Once you’ve gotten rid of any left over shadow under your eye, you can apply your concealer and pressed powder if you’re going to be using it. Step Nine: Apply your black shadow over the liner you put on your lower lash line in step three and then smudge it as you did to the shadow on your top lid in step six. 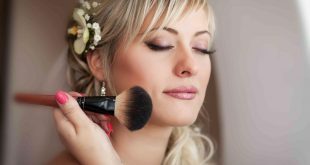 Step Ten: Take your powder brush or cotton ball and sweep under your eye again. This might seem a bit redundant but it’s much easier to sweep up any left over shadow if there isn’t as much there. For that reason you want to sweep under your eye after you do the top lid and then again after you do the bottom lid. If you’d prefer, you can skip this step but I would recommend the second sweep up all the same. Step Eleven: Take the general shadow you used in step seven and blend it in a small circle around your eye. You need to be careful on this one though. The shadow needs to be well blended and you need to make sure you don’t make the circle too big. The circle should be just a little bit larger than your actual eye. If you go too far under your eye you’ll end up looking like a raccoon. If that’s the look you’re going for then by all means, do it up! Go as far under the eye as you want. If you’re going for smoky eyes though, you really need to be careful under your eyes. Step Twelve: Apply your mascara. You want a lot of mascara on those lashes so use at least three coats on top and two coats on the bottom. Read more about applying mascara properly here. Once your mascara has dried, sweep under your eye again and you’re ready to go!